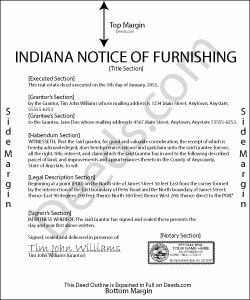 To secure lien rights in Indiana, a lien claimant must provide a residential property owner a Notice of Furnishing. The purpose on the Notice is to apprise the owner that someone is providing material, labor, or machinery on their land and that person may have a right to file a mechanic's lien. A person, firm, partnership, limited liability company, or corporation that sells or furnishes on credit any material, labor, or machinery for the alteration or repair of an owner occupied single or double family dwelling or the appurtenances or additions to the dwelling to: 1) a contractor, subcontractor, mechanic; or 2) anyone other than the occupying owner or the owner's legal representative; must furnish to the occupying owner of the parcel of land where the material, labor, or machinery is delivered a written notice of the delivery or work and of the existence of lien rights not later than thirty (30) days after the date of first delivery or labor performed. IC 32-28-3-1(h). The furnishing of the notice is a condition precedent to the right of acquiring a lien upon the lot or parcel of land or the improvement on the lot or parcel of land. Id. The Notice of Furnishing contains the following information: 1) lien claimant's (or representative's) name, including the form of business; 2) the address where material, labor, or machinery was furnished; 3) the name of the person sold or furnished with material, labor, or machinery; and 4) the date of first furnishing or sale. The Notice must be served on the owner and filed with the county recording office within sixty (60) days of the date of first delivery or labor performed. IC 32-28-3-1(i).